Language Log » Who Has the Biggest Dictionary? Who Has the Biggest Dictionary? The East Asians have an ongoing contest propelled by dictionary size envy. Everybody wants to see who can produce a dictionary with the most entries. The Koreans at Dankook University have just pulled off the amazing feat of compiling a dictionary that has outstripped anything yet generated by the Japanese or the Chinese themselves. 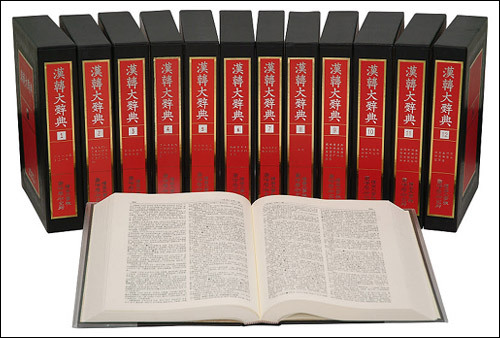 After 30 years of labor and investing more than 31,000,000,000 KRW (equal to more than 25 million USD), the South Koreans have just published the Chinese-Korean Unabridged Dictionary in 16 volumes. This humongous lexicon contains nearly half a million entries composed of 55,000 different characters. You can read more about the Dankook dictionary and its bested competitors here and here. I should note that this is a *word* (CI2 詞 ／ 辭) dictionary as opposed to a *character* (ZI 字) dictionary. The fundamental, crucial difference between these two types of dictionaries is that entries in the former type are composed of both monosyllabic and polysyllabic terms, whereas entries in the latter type are composed only of single characters. Character dictionaries can contain far more than 55,000 entries. For example, the online Japanese repository of Chinese characters has more than 80,000 different forms, and the Zhonghua zihai 中華字海, which was published in China in 1994, has over 85,500 different characters. The fact that the rarest characters in the biggest Chinese-character dictionaries have actually occurred in text — if only in someone's dictionary — implies that the actual frequencies do not continue to drop so rapidly. Still, the expected frequency of codes for characters ranked below 20,000 is surely very small. With a nod to Josh Vittor for calling this to my attention and to Minkyung Ji for additional information.